Every Thursday Paul Boag and Marcus Lillington are joined by a variety of guests to discuss a range of web design related topics. The show is fun, informative and quintessentially British! With content for designers, developers and website owners, you can be sure it will have something for everybody no matter their experience. Too Busy to Read Blog Posts? Listen to Them Instead! 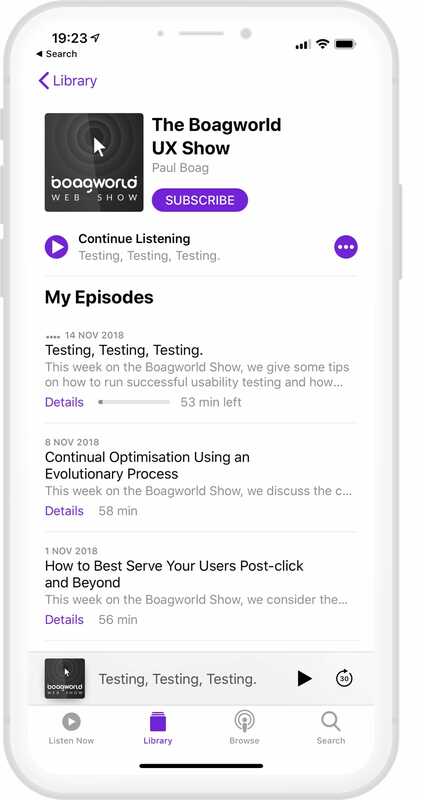 Digital Insights takes blog content on user experience design, digital marketing as well as related topics, and delivers them in a podcast audio format. This week on the Boagworld Show we are joined by Colin Gray from The Podcast Host to talk about how he makes a living from podcasting and its role within a broader content marketing. This week on the Boagworld Show we are joined by Lucy Hardy from the Ellen Macarthur Foundation to talk about how she transitioned her career into becoming a digital team lead. This week on the Boagworld Show we are joined by Sara Soueidan who talks about her career as a developer and how it has taken her all over the world. Once upon a time, a website was built by web designers. Today digital consists of many hugely varied roles which all have to work together. In this season of Boagworld, we look at those different roles and explore what they involve in practice. We ask what exactly people do and how their career led them to where they are today. On this season of the Boagworld show we have something for everyone. Our five experts cover everything from design and development to management and marketing. I put your digital management problems to some of the smartest people in the industry and see how they would solve your issue. In a departure from our normal subject matter, season 14 of the Boagworld Show looks at passion. Is it important to be passionate about your job and what influence does it have on success? In this season of the Boagworld Show we explore the many myths surrounding user experience design. We unpack what user experience design really is. By the end of the season we guarantee you will have a much bigger definition. One that stretches from your Photoshop comp all the way to the corporate boardroom. Running a successful web design business is becoming tougher than ever before. It is especially hard if you are doing it alone. That is why in this season of the show we answer your questions, discuss your challenges and connect you with other entrepreneurs. Digital is scary! It’s fast moving and incredibly diverse. Even the most dedicated of digital professional cannot hope to keep up. That is why in season 11 of the podcast we are going to delve into some of those specialist areas that you may have overlooked. In our tenth season of the Boagworld Show we are going to embrace the idea of top ten lists. Love them or hate them lists are everywhere online. We are going to go list crazy and create our own top ten lists for everything from coding tools to usability tips. Season 9 of the Boagworld Show focuses on people and projects. Not web celebs or ground breaking internet startups. We are going to talk to real people working on everyday websites. People like you. Season 8 of the Boagworld Show takes a look at the bigger picture. It's no longer enough for an organisation to have a website and Facebook page. We are moving away from the industrial era into a new digital economy. But what does that mean for business and how does it effect us as web professionals? Season 7 of the Boagworld show focuses on the great debates raging in the web design community. Whether it be responsive design vs native apps or flat design vs skeuomorphism, we are going to investigate the facts and discuss the options. Season 6 of the Boagworld show is all about your questions. From questions about dealing with senior management to advice about the latest design technique, we are here to help. If we can’t answer a question, then we will find somebody who can. Season 5 of the boagworld show highlights the best web design advice out there. From posts that have become timeless classics to the latest innovations, each Thursday we will highlight articles worthy of your attention and share our thoughts on each. There are great apps and tools being released everyday to help those involved in the web do their job better. With so much out there, its hard to find the best tool for the job. That is why season 4 focuses on awesome apps and terrific tools. Vote now, for apps you want to see featured. Client Centric Web Design will propose a different model for building websites, one where the web designer and client work in a collaborative relationship. This introduction to an alternative approach to web design results in better sites, more satisfying projects and happier clients. In this season we turn the theoretical into the practical when we take all we have learn't in the past and apply it to the rebuild of boagworld.com. In this season of Boagworld we explore ways that your website can begin to pay for itself. We look at how to move your site from being a drain on resources to a key component in your business strategy. Subjects include: developing business objectives, measuring successes, creating positive user experiences, implementing calls to action, refining your site and marketing effectively. The original Boagworld Podcast ran for over 200 episodes and was the first podcast on web design. Aimed at those who design, develop and run websites, it won many awards and grew rapidly from its humble beginnings in 2005. We reinvented the show in 2010 but the old episodes have been kept online and redefined as 'classic episodes'.